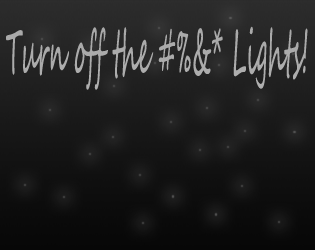 Turn off the %^@% Lights! A game, made entirely in 3 days, by Emily Bloode. Use the arrows, or WASD, to move around, and E to interact. Flip switches, change plug sockets, and make sure to get everything working right! Explore the house and see what weird stuff you collect! There exists a possibility this will get worked on further if it does well in the voting. I loved working on it, it's my first game jam and my first really completed project! I think you'll love it! It should be mentioned, most of the levels actually want you to turn on all the lights. They start off, actually. But, time came to it, and this was the most I could do. So, turn on the $%&@ lights, you brave player! This is a really cool prototype. I've always been into games but only recently started looking into jams and doing my first public game....this was inspiring. Thanks!